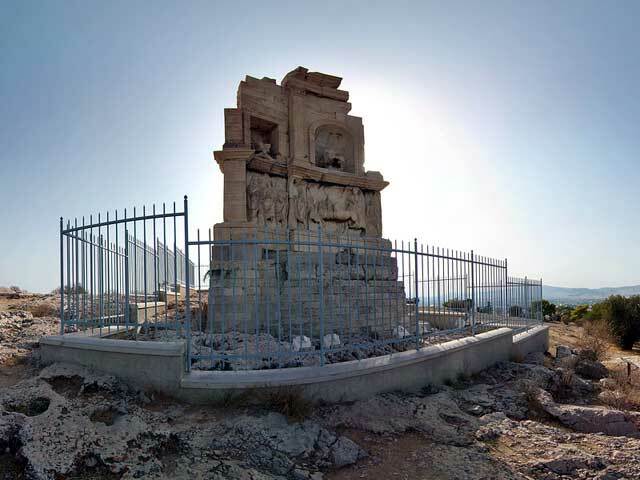 The monument of Philopappos is dated to 114-116 A.D. It was erected by the Athenians in honor of the great benefactor of their city, the exiled prince of Commagene, Julius Antiochus Philopappos who settled in Athens, became a citizen and assumed civic and religious offices. According to Pausanias, the monument was built on the same site where Mousaios was formerly buried. The monument measures 9.80 x 9.30 m. and contains the burial chamber. It is built of white Pentelic marble on a socle 3.08 m. high, made of poros stone and veneered with slabs of Hymettian marble. The north side of the monument, which was visible from the Acropolis, was the facade, and beared lavish architectural decoration. The monument was preserved almost intact as late as the 15th century A.D. when Cyriacus of Ancona visited the site and copied the five inscriptions on the facade. The three inscriptions below the statues record the names of the persons represented. The central figure is Philopappos, son of Epiphanes, on the left is Antiochus, son of king Antiochus, and on the right was king Seleucus Nicator, son of Antiochus.